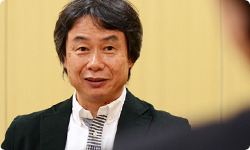 Today I’m going to talk to Miyamoto-san about Nintendo 3DS Guide: Louvre. The Nintendo Direct we filmed at the Louvre Museum1 in Paris will be up by the time this interview goes live, but the whole experience still feels a little strange to me. I say that because it has been such an interesting journey to be able to have a front row seat in watching you pursue your idea of placing Nintendo DS systems for use in public spaces2, long before the release of Nintendo 3DS, and now being able to see that idea become a reality at none other than the world’s best museum. I’m sure that for you, the scheme you had back then, and this project with the Louvre must have very strong ties, so let’s have you start off there. 1. The Louvre Museum: A national French museum in Paris, which was opened in 1793. One of the world’s largest museums, as well as one of the world’s most famous landmarks, showcasing approximately 35,000 works of art from the prehistoric era to the middle of 19th century. Nintendo formed a partnership with the Louvre in April 2012. 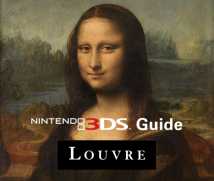 As part of this partnership, Nintendo provided the Louvre Museum with Nintendo 3DS systems equipped with an audio guide. 2. Nintendo DS systems for use in public spaces: A project to bring various daily services to public spaces using Nintendo DS systems, prepared from 2009 and 2010. Believing that “something fun will always happen no matter where you are, as long as you have your Nintendo DS with you,” various uses and services were implemented using the service in museums, art museums, shopping malls and schools. Later, a proprietary software, Make It Yourself: Nintendo DS Guide, was released in Japan so that users could use this simple system to make their own guides. Sure. To begin with, I feel very lucky myself. Going to museums is actually a hobby of mine. So much like when we created Pikmin3, nintendogs4 and Wii Fit5, you were able to turn one of your hobbies into a part of your job.3. Pikmin: An action game where you search for treasure with strange creatures called Pikmin. Mr. Miyamoto watching ants while he was gardening inspired the game’s development. The first game was released for Nintendo GameCube in Japan in October 2001, and in Europe in June 2002. The latest game in the series, Pikmin 3, was released for Wii U in July 2013.4. nintendogs: A game released for enjoying communication with puppies. Released for the Nintendo DS system in April 2005. 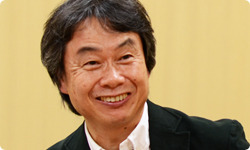 Mr. Miyamoto actually owning a puppy spurred its inception. Later, as he owned a cat, nintendogs + cats was released simultaneously with the Nintendo 3DS system in February 2011 in Japan. It was released in Europe in March 2011.5. Wii Fit: Released in December 2007, a fitness-like game that you play standing on the Wii Balance Board accessory. Mr. Miyamoto‘s discovery that just the act of measuring your own weight can be fun inspired the game’s development. In October 2009 Wii Fit Plus was released, which is an expanded version of Wii Fit that includes the original activities from Wii Fit, plus additional content on the Game Disc. The retail version of Wii Fit U for the Wii U console is planned for release on December 13th, 2013. Between November 1st, 2013 and January 31st, 2014, a campaign is running offering a downloadable free 31-day trial version of Wii Fit U. A compatible balance board, such as the Wii Balance Board, is required to play. That’s true. But actually the audio guides available at museums were the jumping off point for the idea for the use of Nintendo DS in public spaces. Audio guides, in this case, are devices that you can rent at museums that give an audio explanation of the various exhibits. Yes. I always rent an audio guide to look at exhibits when I go to museums. It gives you a much richer experience because it provides insights and discoveries that you wouldn’t have made otherwise. Looking at an exhibit with an audio guide is such a different experience than viewing it without any knowledge. It’s completely different. But most audio guides were like portable CD players where you had to enter numbers that are displayed by each exhibit in order to hear the explanations, and they weren’t very easy to use. Well, there weren’t what we call smart devices6 back then.6. Smart devices: Mobile information devices like smart phones or tablets. At the same time, we began to get inquiries at Nintendo from public institutions like schools and hospitals asking us if they could do something with Nintendo DS. So then, around the time I started thinking that I wanted to figure out the specifics, we had the opportunity to meet with Oriental Land.7 After several discussions with them, we decided to offer some services as a trial at Ikspiari8, the large shopping facility in the Tokyo Disney Resort in Maihama.7. Oriental Land Co., Ltd.: The company that operates the Tokyo Disney Land Resorts.8. Ikspiari: A shopping mall inside the Tokyo Disney Resort at Maihama, Urayasu City, in Chiba. The Ikspiari Nintendo DS Guide.99. Ikspiari Nintendo DS Guide: A free service from Nintendo and Oriental Land Co., Ltd. that was offered from April 2009 to January 2010. Customers downloading the software at set places in Ikspiari could use their Nintendo DS systems as a guidebook, and other features like navigation, various information search functionality for Ikspiari and original games. Yes. One of the concepts behind Ikspiari was to make it a fun adventure for guests to hunt for different stores, so the architecture is purposefully a bit complicated. So we put in an automatic mapping system along with a shop guide. We set up wireless LAN access points at various places inside Ikspiari as well as Nintendo DS systems to download the software, so that a user could see their current location in real time. It was a system where it calculated its location by estimating the signal strength10 from the various wireless LAN antennas and Nintendo DS systems, right?10. Signal strength: Strength of the electric wave. Distance can be judged by looking at the strength of the signal from the wireless LAN access point. Yes. We ended the service in Ikspiari after a little less than a year, and after that we offered various guide services to such facilities as Osaka Aquarium Kaiyukan11, Shin-Enoshima Aquarium12, Kyoto Seika University13 and the Kyoto Municipal Museum of Art14. 11. Kaiyukan: An aquarium in Osaka, opened 1990. The Nintendo DS guide service started there in April 2010. 12. Shin-Enoshima Aquarium: An aquarium in Shonan Kaigan Park in Fujisawa City, Kanagawa. The Nintendo DS guide service started in May 2010. 13. Kyoto Seika University: The graduate exhibition for the Department of Visual Design, Faculty of Design at Kyoto Seika University, exhibited at the Kyoto Municipal Museum of Art from January 27th, 2010 to January 31st, 2010. The exhibit utilised a Nintendo DS audio guide. 14. Kyoto Municipal Museum of Art: Opened 1988. Had a time limited guide service using the Nintendo DS system from April 28th, 2009 to May 27th, 2009. Those were the original form of what would later be released as the downloadable software, Make It Yourself: Nintendo DS Guide15.15. Make It Yourself: Nintendo DS Guide: Guide software released as Nintendo DSiWare in Japan in November 2010. It allows users to create guide services by assembling photographs and sound clips. Yes, that’s the way things went. The actual system isn’t something only for big commercial facilities. It’s easy enough for anyone to use even on a small scale, for places like school festivals and bazaars. The system is set up so that if the presenters make their data with the software, visitors who bring their Nintendo DS can see information about the exhibits and products. This is all doable only with a Nintendo DS, without having to set up a server on a PC. It’s so easy to use, and it’s a lot of fun even today. To put it another way, it was a project to make and hand out the tools for making a guide. I said, “If they used this at the Louvre, everyone else would follow suit.” (laughs) But we hadn’t gotten the best results with the system then. And just when we were wondering where to go from there, the Louvre came up. The Louvre discussion came about because of an introduction from (Shinji) Hatano-san16, who has since retired as a member of our board.16. Shinji Hatano: Former General Manager of the Nintendo Marketing Division and the Senior Managing Director. 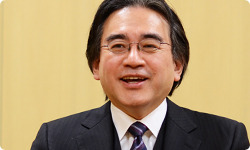 He is currently Corporate Adviser of Nintendo. Right. Originally it wasn’t about us wanting to use the Nintendo DS system as an audio guide, but I had my big ambition! (laughs) So as soon as we started discussions I talked to them about letting Nintendo do an audio guide for them. Our contact was very excited by Nintendo’s new idea for using the Nintendo 3DS system that you presented then. That’s right. Mr Loyrette17, who was director at the time, was an advocate for multimedia. We both agreed to move forward, and that’s how we ended up going to do some real investigation.17. Henri Loyrette: Former director of the Louvre Museum. He served as director for the Lourve Museum from 2001 to 2013.